Tahir, H., Atika, S., Muhammad, S. (2018). Synthesis of Kaolin Loaded Ag and Ni Nanocomposites and Their Applicability for the Removal of Malachite Green Oxalate Dye. Iranian Journal of Chemistry and Chemical Engineering (IJCCE), 37(3), 11-22. Hajira Tahir; Saud Atika; Saad Muhammad. "Synthesis of Kaolin Loaded Ag and Ni Nanocomposites and Their Applicability for the Removal of Malachite Green Oxalate Dye". Iranian Journal of Chemistry and Chemical Engineering (IJCCE), 37, 3, 2018, 11-22. Tahir, H., Atika, S., Muhammad, S. (2018). 'Synthesis of Kaolin Loaded Ag and Ni Nanocomposites and Their Applicability for the Removal of Malachite Green Oxalate Dye', Iranian Journal of Chemistry and Chemical Engineering (IJCCE), 37(3), pp. 11-22. Tahir, H., Atika, S., Muhammad, S. Synthesis of Kaolin Loaded Ag and Ni Nanocomposites and Their Applicability for the Removal of Malachite Green Oxalate Dye. Iranian Journal of Chemistry and Chemical Engineering (IJCCE), 2018; 37(3): 11-22. The present study focuses on the synthesis of Kaolin loaded Silver (Ag-KNC) and Nickel (Ni-KNC) nanocomposites by co-precipitation method. The surface morphology of them was determined by SEM technique while chemical composition was determined by FT-IR technique. The removal of Malachite Green Oxalate (MGO) was preceded by the adsorption method using (Ag-KNC) and (Ni-KNC). The adsorption models like Freundlich, Langmuir, and D-R (Dubinin-Radushkevich) was utilized to figure out the applicability of the tactic. Moreover, the pH at the point of zero charges (pHpzc) was determined to find surface neutrality. The effect of electrolyte (KCl) on the removal efficacy of MGO was additionally investigated. Furthermore, the ionic strength and thickness of Electrical Double Layer (EDL) were also determined. Thermodynamic parameters like free energy (∆Go), entropy (∆So) and enthalpy (∆Ho), of the system, was also investigated. The adsorption Kinetic was resolute by Intra Particle Diffusion (IPD) and Boyd’s models. Moreover, the adsorption efficacy was effectuality was ascertained to be 88% for (Kaolin), 97% for (Ag-KNC) and 95% for (Ni-KNC) systems. Xun W., Jing Z., Qing P.andYadong L.,A General Strategy for Nanocrystal Synthesis, Nature, 437: 121-124 (2005). Balci S., Bittner A.M., Hahn K., Scheu C., Knez M., Kadri A., Wege C., JeskeH.and Kern K., Copper Nanowires within the Central Channel of Tobacco Mosaic Virus Particles, Electrochimicaacta, 51(28): 6251- 6257 (2006). Meng H., Peng H., Chunlei Z., Feng C., Can W., Jiebing M., Rong H., Daxiang C.,A General Strategy for the Synthesis of Upconversion Rare Earth Fluoride Nanocrystalsvia a Novel OA/Ionic Liquid Two-Phase System, Chemical Communications (Cambridge, England), 47(33): 9510 - 9512 (2011) . Hajira T., Uroos A., Lignocellulosic: Non-Conventional Low Cost Biosorbent for the Elution of Coomassie Brilliant Blue (R-250),International Journal of Chemistry, 6(2): 56-72(2014). Nandapure B.I., Kondawar S.B., Salunkhe M.Y., Nandapure A.I.,Magnetic And Transport Properties of Conducting polyaniline/nickel Oxide Nanocomposites, Advanced Materials Letters, 4(2): 134-140 (2013). Ramana G.V., Balaji P., Kumar R.N., PrabhakarK.V., Jain P.K,Mechanical properties of Multi-Walled Carbon Nanotubes Reinforced Polymer Nanocomposites, Indian journal of Engineering & Material Sciences, 17: 331-337 (2010). Amy M.M., Namiko Y., Matthew A.P., Kenneth E.G.,Thermal Conduction in Aligned Carbon Nanotube PolymerNanocomposites with High PackingDensity, ACS Nano, 5(6): 4818-4825 (2011). Joy K.M., Young W.C., Nak S.C.,Preparation and Characterization of Rubber-Toughened poly(trimethylene terephthalate)/ organoclaynanocomposite, Polymer Engineering & Science, 47(6): 863-870 (2007). Sarika S., Barick K.C., Bahadur D.I.,Functional Oxide Nanomaterials and Nanocomposites for the Removal of Heavy Metals and Dyes, Nanomaterials and Nanotechnology, 3(20): 1-19 (2013). Shameli K., Ahmad M.B., Yunus W.Z., Ibrahim N.A., Darroudi M.,Synthesis and Characterization of Silver/Talc Nanocomposites Using the Wet Chemical Reduction Method, Journal of Nanomedicine, 5: 743-751 (2010). Saeedeh H., Mohammad R.S.,Novel Ag/Kaolin Nanocomposite as Adsorbent for Removal of Acid Cyanine 5R from Aqueous Solution, Journal of Chemistry, 2013: 1-7 (2013). Kamyar S., Mansor B.A., Mohsen Z., Wan M.Z.W.Y., Nor A.I.,ParvanehS. and Mansour G.M., Synthesis and Characterization of Silver/montmorillonite/ chitosan Bionanocomposites by Chemical Reduction Method and Their Antibacterial Activity, Int. J.Nanomedicine, 6: 271-284 (2011). Meshram S., Limaye R., Ghodke S., Nigam S., Sonawane S., Chikate R.,Continuous Flow Photocatalytic Reactor Using ZnO–Bentonitenanocomposite for Degradation of Phenol, Chemical Engineering Journal, 172(2): 1008-1015 (2011). Zhai H.J., Sun D.W., and Wang H.S., Catalytic properties of Silica/Silver Nanocomposites, Nanoscience Nanotechnology, 6(7): 1968 - (2006). Rapsomanikis A., Papoulis D., Panagiotaras D., Kaplani E., Stathatos E., NanocrystallineTiO2 and Halloysite Clay Mineral Composite Films Prepared by Sol-Gel Method: Synergistic Effect and the Case of Silver Modification to the Photocatalytic Degradation of Basic Blue- 41 azo Dye in Water, Global NEST Journal, 16: 485-498 (2014). Nazar H.K., Sirajuddin, Razium A.S., Syed T.H.S., Keith R.H., Abdul R.K.,Synthesis and Characterization of Highly Efficient Nickel Nanocatalysts and Their Use in Degradation of Organic Dyes, International Journal of Metals, 2014: 1 - 10 (2014). Rodiansono R., Takayoshi H., Shogo S.,Total Hydrogenation of Biomass-Derived Furfural Over Raney Nickel-Clay Nanocomposite Catalysts, Indo. J. Chem., 13(2): 101- 107 (2013). Awwad, A.M., Albiss B.A., Salem N.M.,Antibacterial Activity of Synthesized Copper Oxide Nanoparticles Using Malvasylvestris Leaf Extract, SMU Med. J., 2:91-101 (2015). Sandipan C., Sudipta C., Bishnu P.C., Arun K.G.,Adsorptive Removal of Congo Red, A Carcinogenic Textile Dye by Chitosan Hydrobeads: Binding Mechanism, Equilibrium and Kinetics, Colloids and Surface A Physicochemical and Engineering Aspects, 299: 146-152 (2007). Jiwan S., Uma, Sushmita B., Yogesh C.S., A Very Fast Removal of Orange G from its Aqueous Solutions by Adsorption on Activated Saw Dust: Kinetic Modeling and Effect of Various Parameters, International Review of Chemical Engineering, 4(1):1-7 (2012). Armen B.A.,Theory of Global Sustainable Development Based on Microalgae in Bio and Industrial Cycles, Management-Changing Decisions in Areas of Climate Change and Waste Management, Journal of Sustainable Bioenergy Systems, 3(4): 287-297 (2013). Iqbal M.J., Ashiq M.N.,Adsorption of Dyes from Aqueous Solutions on Activated Charcoal, J. Hazard. Mater, 139: 57-66 (2007). Dotto G.L., Moura J.M., Cadaval T.R.S., Pinto L.A.A.,Application of Chitosan Films for the Removal of Food Dyes from Aqueous Solutions by Adsorption, Chemical Engineering Journal, 214: 8-16 (2013). Debabrata C., Vidya R.P., Anindita S., Moulik S.K., Removal of Some Common Textile Dyes from Aqueous Solution Using Fly Ash, J. Chem. Eng. Data, 55(12): 5653-5657 (2010). Oladipo O., Randy J.M., Peter W.S.,X-Ray Diffraction Study on Highly Ordered Mesostructured Thin Films, JCPDS-International Centre for Diffraction Data, Advances in X-ray Analysis, 45: 359-364 (2002). Hassan H. Hameed B.H.,Fenton-like Oxidation of Acid Red 1 Solutions Using Heterogeneous Catalyst Based on Ball Clay, International Journal of Environmental Science and Development, 2(3): 218-222 (2011). Meshram S., Limaye R., Ghodke S., Nigam S., Sonawane S., Chikate R.,Continuous Flow Photocatalytic Reactor Using ZnO–Bentonitenanocomposite for Degradation of Phenol, Chemical Engineering Journal, 172(2): 1008-1015 , (2011). George A.K., Insik J., Marit N.H., Ahmed M.A., Jayeeta B., Bharam P.,Fluorinated Analogs of Malachite Green: Synthesis and Toxicity, Molecules, 13(4): 986-994 (2008). Bahareh S., Saeedeh H.,Synthesis of Kaolin/Ag Nanocomposite as an Efficient and Versatile Reagent for the Synthesis of 1,8-Dioxo-Octahydroxanthene Derivatives, Synthesis and Reactivity in Inorganic, Metal-Organic, and Nano-Metal Chemistry, 44: 424-428 (2014). Ghulam M., Hajira T., Muhammad S., Nasir A.,Synthesis and Characterization of Cupric Oxide (CuO) Nanoparticles and Their Application for the Removal of Dyes, 12(47): 6650-6660 (2013). Mantosh K.S., Priya B., Papita D.J., Plant-Mediated Synthesis of Silver-Nanocomposite as Novel Effective Azo Dye Adsorbent, Applied Nanoscience, doi:10.1007/s13204-013-0286-x (2013). Hajira T., Muhammad S., Zainab Q.,Physiochemical Modification and Characterization of Bentonite Clay and Its Application for the Removal of Reactive Dyes, International Journal of Chemistry,5(3): 19- 32 (2013). Venkateswaran V., Priya T.,Equilibrium and Kinetics of Adsorption of Cationic Dyes by STISHOVITE-Clay –TiO2 Nanocomposite, Intrenational Journal of Modern Engineering Research (IJMER), 2(6): 3989-3995 (2012). Gholam R.M., Roghaye Z.J.,Removal Kinetic of Cationic Dye Using Poly (Sodium Acrylate)-Carrageenan/Na-Montmorillonite Nanocomposite Superabsorbents, Mater. Environ. Sci., 3(5): 895-906 (2012). Saad M., Hajira T., Khan J., Hameed U., Saud A., Synthesis of Polyaniline nanoparticles and their application for the removal of Crystal Violet dye by Ultrasonicated adsorption Process Based on Response Surface Methodology, Ultrasonic. Sonochem., 34: 600-608 (2017). and Equilibrium Study, Iranian Journal of Chemistry & Chemical Engineering (IJCCE), 31(3): 19-27 (2012). Yao-Jen T., Chen-Feng Y., Chien-Kuei C.J., Kinetics and Thermodynamics of Adsorption for Cd on Green Manufactured Nano-Particles, Hazard Mater., 235-236: 116-122 (2012). Mokhtari P., Ghaedi M., Dashtian K., Rahimi M.R., Purkait M.K., Removal of Methyl Orange by Copper Sulfide Nanoparticles Loaded Activated Carbon: Kinetic and Isotherm Investigation, Journal of Molecular, 219: 299-305 (2016). SaadM., Hajira T.,Synthesis of Carbon Loaded γ-Fe2O3Nanocomposite and Their Applicability for the Selective Removal Of Binary Mixture of Dyes by Ultrasonic Adsorption Based on Response Surface Methodology, Ultrasonic. Sonochemis., 36: 393-408 (2017). Kamali M., Ghorashi S.A.A., Asadollahi M.A., Controllable Synthesis of Silver Nanoparticles Using Citrate as Complexing Agent: Characterization of Nanopartciles and Effect of pH on Size and Crystallinity, Iranian Journal of Chemistry and Chemical Engineering (IJCCE), 31(4): 21-28 (2012). Okewale A.O., Babayemi K.A., Olalekan A.P.,Adsorption Isotherms and Kinetics Models of Starchy Adsorbents on Uptake of Water from Ethanol – Water Systems, International Journal of Applied Science and Technology, 3(1): 35-42 (2013). 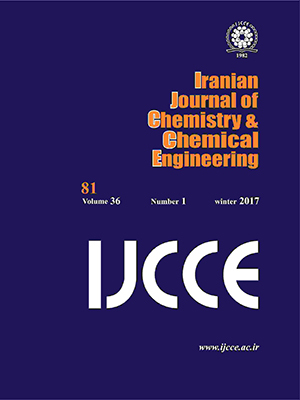 Naghizadeh A., Ghafouri M., Synthesis and Performance Evaluation of Chitosan Prepared from Persian Gulf Shrimp Shell in Removal of Reactive Blue 29 Dye from Aqueous Solution (Isotherm, Thermodynamic and Kinetic Study), Iranian Journal of Chemistry and ChemicalEngineering (IJCCE), 36(3): 25-36 (2017).